During incubation, eggs must be turned several times a day to prevent the yolk from settling on one side and to exercise the embryo. Turning the eggs by hand is the most time demanding and time consuming part of egg incubation. 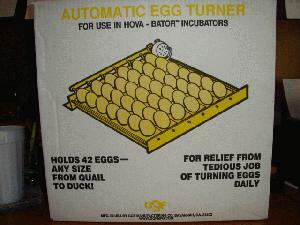 Specifications: Turner holds a total of six egg racks. Each Universal Egg Rack holds eggs any size from a partridge egg up to duck eggs (total 41 eggs per turner). 110 Volt AC (220 Volt available for export). CAN BE USED WITH ALL HOVA-BATOR INCUBATORS.